VRS technology from Kofax ensures that your scanning is as efficient and easy as possible, while also improving both the quality of the scanned images and the automated capture of information from your paper documents and forms. The result is lower scanning costs, lower data entry costs, and faster access to your information. 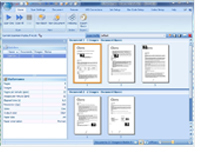 With VRS you can just dump in a mixed batch of documents and it automatically straightens and crops everything! Kofax offers numerous rebates on a wide variety of products. Select below to see a complete listing.